Availability of the iPad will expand to all of Best Buy's U.S. stores on Sept. 26, amounting to 1,093 of the company's nationwide retail locations selling Apple's device. Best Buy announced the expansion on Tuesday, the same day that the company revealed its strong quarterly earnings. Those sales were buoyed by demand for devices like the iPad, the company said. The iPad was available at Best Buy when the device launched earlier this year, though it was limited to 673 retail stores with Apple Shop locations. Now, All 1,093 stores in the U.S. will carry both the Wi-Fi and Wi-Fi + 3G models on Sept. 26. "Technology is becoming more and more personal, and our customers say they really value visiting a Best Buy store to touch and try the iPad for themselves," said Wendy Fritz, senior vice president of computing at Best Buy. "Were delighted that well soon make that opportunity available to everyone whod like to come see us, and experience this device in any Best Buy store nationwide." 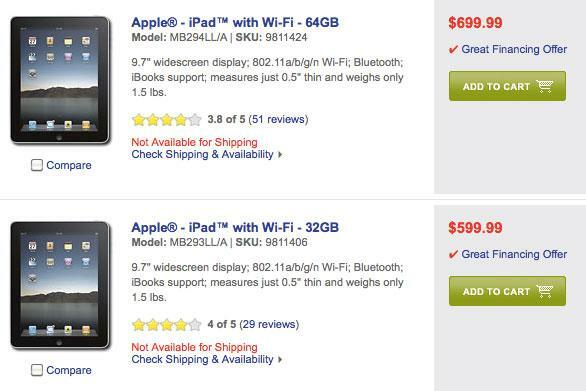 Best Buy officials indicated that stores experienced "constrained inventory" when the iPad launched earlier this year. But with supply issues apparently alleviated, Chief Executive Brian Dunn anticipates that the iPad, along with other tablet devices, will be "big for us during the holidays. In addition to selling the iPad, Best Buy stores will also carry a range of accessories for Apple's touchscreen tablet. Apple is also rumored to make the iPad available for sale at Target in the coming weeks, as recent evidence has suggested the device could see a launch in stores on Oct. 3. Earlier this year, Walmart, the largest retailer in the U.S., also indicated it hopes to sell the iPad by the end of 2010. Expansion to more retail outlets has likely been made possible by improved supplies. Recently, iPad shipping times on Apple's website improved to 24 hours, a major improvement from earlier this year, when shipping times were measured in weeks and many stores were completely sold out.